Sadly, we had a few things that couldn’t happen: Treskilliard, despite many hours of trying, could not get the horse lorry started to bring their beautifully dressed horses to share the day with us, the face-painter was unwell, as was a staff member at Feadon Farm Wildlife Centre. HOWEVER, we still had the most incredible day, with more visitors than ever before. We are also very excited that our fund-raising seems to have been the best ever too. So THANK YOU! to all the visitors, volunteers, stall-holders, staff and trainees, performers and exhibitors. As well as all our staff and trainees who have all worked so hard in the run-up to the day; ensuring the site was looking its absolute best and the car-parking could run smoothly. Bill & Flo Martindale, once again, helped with that by offering their field for overflow parking, which was pretty much full by 1pm. Many local residents support us before, during and after the day and without this support the day would be pretty difficult to run. The procession with Haylestorm Samba, was magnificent and, as always, such a joy to see our apple trees dressed with rainbow streamers flying in the breeze. The weather could not have been better; for those in the tunnels and glasshouses as well as outside. Kids crafts was stacked full at all times – we need to cut more willow next year! All our caterers were busy and popular and charity and craft stalls had lots of interest throughout the day. Apple Tasting was as popular as ever, with visitors able to choose a tree to buy, based on the apple they liked the taste of the best. We did our best with identification of apples brought in by visitors, and, where we were stumped, we had Brogdale ID forms ready for people to take away so they could send their apples off to the world-class-experts at Brogdale. Our thanks to Andrew Gunderson, of Duchy College, for being their to help our visitors with their orchard pests, diseases and management, and our staff member Trev, who could keep the hydro-press demo going whilst talking all things cider. Between us, we can safely say, we had apples covered in most of their uses! We hope to see you all again on 13th October 2018, which we are already planning, by looking at the highs and lows of 2017. 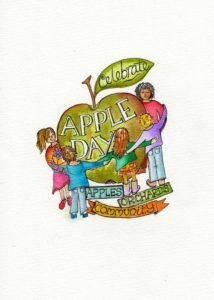 We are already planning our Apple Juice Bar, where you can try lots of different varieties of apples as juice and can even make up your own ‘cocktails’ of varieties. We thought the children and non-alchohol-consuming adults needed an alternative to our very popular ‘flight’ of cider! Thanks again and remember to put 13th October into your diaries for 2018. 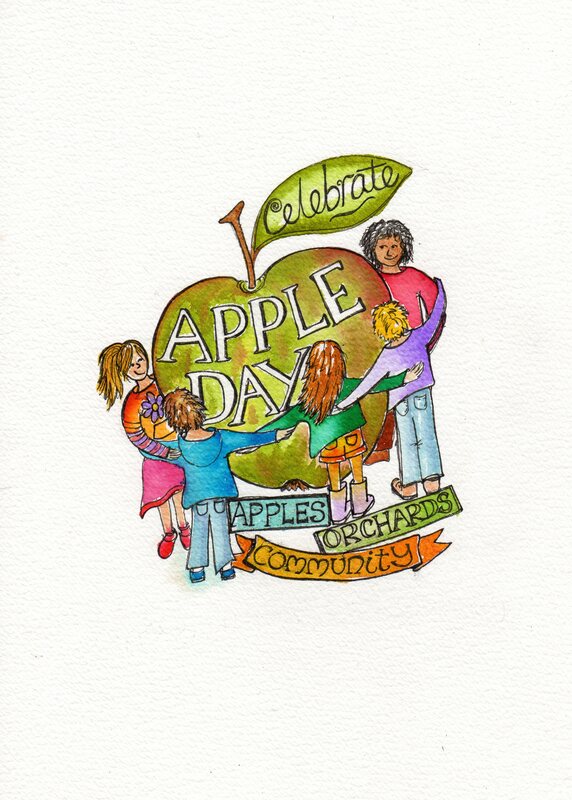 It’s that time of year again and we are gathering apples every day in anticipation of our annual celebration of apples, orchards and community, just a few weeks away. Apple Exhibition showcasing all the apples we grow on site at Kehelland. Identification; please bring at least 3 apples and ideally some leaf and a photograph of the tree if possible (no promises, but lots of information! ), Orchard advice from Andrew Gunderson (Duchy College). Apple Trees for sale from our own grafted stock and Adam’s Apples (Devon) growing apple varieties that we know do well in Cornwall. There will be juice pressing on our 12ltr hand-press in the exhibition space, plus a bit commercial press too. As well as all our own plants, fresh produce, preserves, woodcraft and spring bulbs available on the day from our shop, we also welcome the Camborne Produce Market with their usual array of stalls plus some special guests: Kyfyth Kernow – Preserves, Cornish Food Box Company, Kelp Bakery, Ceinwin’s Needlebox Services, Porthleven Cornish Crab, Hidden Kitchen & Dining, Flavio’s Cakes and treats. Across the site will be a wide variety of local independent traders and crafts folk, including the Cornwall Association of Wood-turners who support us so well throughout the year, making all sorts of items from bat boxes to plant labels and some major structures both on site and at our friends at the Cornish Food Box Company. National Street Food awards for best dessert! ), Hidden Kitchen and Dining, Flavio’s and Maid on Wheels serving up sage & apple sausages made with our own apples. Plus a well stocked bar serving up and offering tastings of an array of Cornish ciders and serving hot pasties too. Children’s Activities and crafts with the help of the Helston Woodcraft Folk. 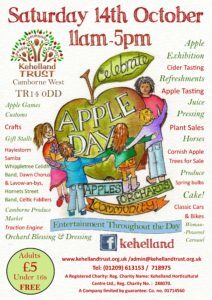 So popular last year, we are continuing to put on a wide variety of apple and orchard related crafts, gifts and games across the site, culminating in our Samba-led procession to the orchard to bless and dress the trees. 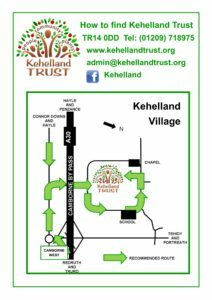 The Cornish Morris Minor Owners Club have chosen Kehelland Trust as their charity of the year. So, much to our delight, the beautiful moggies will be gracing our lawn and you can get a good look at some of these classic cars. In the centre of our lawn is our ever-popular woman-powered carousel, candyfloss and vintage ice-cream with Delicious Wishes. Not forgetting the Butterfly Conservation Society, Cornish Bee-Keepers association, Wildlife Trust and rare-breed horses and face-painting with Dot Dean. There will not be a dull moment across site with Celtic Fiddlers, Whippletree Celidh Band, Dawn Chorus and Lavow-an-byas choirs, Hornets Street Band and Haylestorm Samba all in attendance to keep our toes tapping. Free parking. Follow the Signs! 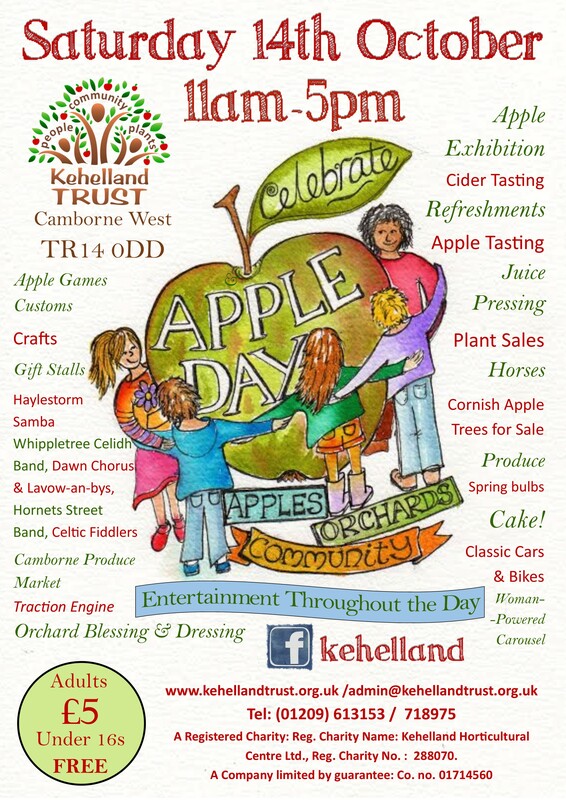 Fancy free entry to our apple day in return for a couple of hours volunteering? 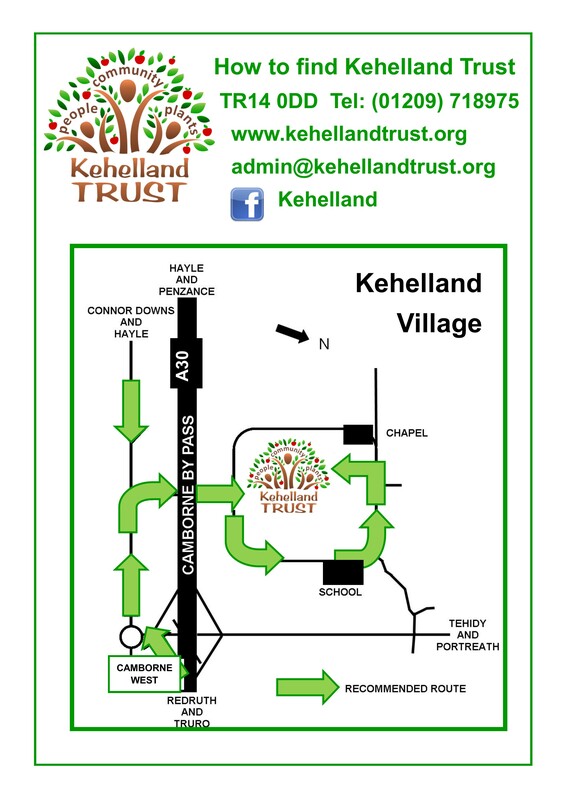 Please email admin@kehellandtrust.org.uk for more details. Not sure where we are? Here are some directions. Hi – can I bring my small well-behaved dog? Subscribe to our newsletter and join our 95 subscribers.